For many students without a TV on campus, watching live TV is a luxury saved for trips home. With Campus Contour, students can watch live TV anytime they want on the William & Mary campus. 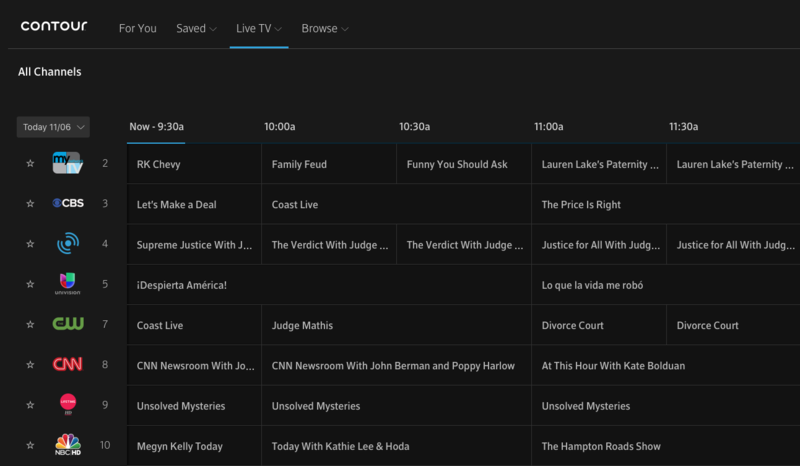 Campus Contour is a streaming service from Cox that lets you watch live Cable TV on your computers, tablets and phones. It is available to all William & Mary students on campus. By going to tv.wm.edu and logging on with their WMUserid, students can stream Cable TV at anytime. Last fall, IT started to work on making the switch from an analog system to a fully digital TV system on campus. It was then that the idea of adding Contour, one of the products offered by Cox, also arose. By February 2017, the service was live and started to roll-out for widespread use. Functionally, Contour is not that much different from Netflix or other online streaming services. W&M IT’s Videoconference and CATV Engineer Dave Shantz explained how Contour operates over the digital network as opposed to the coaxial network that traditional cable runs over. Both the regular campus cable and Contour come from Cox, just through different kinds of networks. ‘The quality behind each one should be identical,” Shantz said of traditional cable and Contour. The only slight difference, he said, is that Contour might be a second or two behind the coaxial cable TV. This is because when watching video over a computer rather than a TV, a computer has more information to process. Still, the difference is less than a few seconds and barely noticeable. Network Engineer Clarke Morledge helped work with Cox to make sure the William & Mary digital network had enough room to support Contour. A streaming service like Contour can take up more bandwidth than regular cable. This is because it is a unicast system, where data comes from one source to one receiver, versus the multicast system of traditional cable, where data comes from one source to multiple receivers. In order to accommodate Contour, “we have dedicated a one gigabit circuit to Cox’s content data network,” Morledge said. The channel package for William & Mary’s Campus Contour has 120 channels, including ESPN, Showtime, and some local channels. Contour also offers recently aired episodes or movies to watch on demand. So even if you do miss an episode of your favorite show, you can catch it on Contour rather than having to pay to watch it from a different streaming service. Shantz said that IT is able to see the number of people using Contour at a given time. On the usage graph, there were noticeable spikes in use for events like the Oscars or around big sports games, demonstrating how useful Contour can be for students hoping to watch live events. Morledge said trends are moving more towards streaming services rather than traditional cable. Still, William & Mary is ahead of the curve for the state. “Only a few universities in Virginia have started to offer a streaming service like Contour,” he said. Contour can be accessed through the William & Mary Mobile App or by going to tv.wm.edu while on campus. Enjoy!